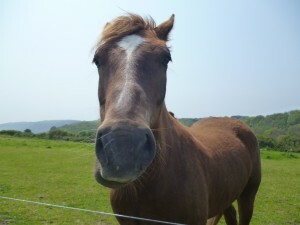 A carriage ride around Sark is perhaps the best introduction to the island. The high vantage point gives views over the hedges, and the quietness of this mode of travel is characterised by creaking of the harness, the jingle of the rings on the horse’s bit and the rhythmic thud of the hooves on un-tarmacked roads. All the carriage drivers have to take a test to obtain their Carriage Drivers Licence. This involves driving skills and horsemanship, and a knowledge of the history of Sark – they not only drive you around but also act as guides. 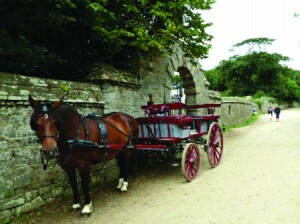 There are two main types of vehicles used on Sark – a carriage which can seat six people (four in the back and two in front beside the driver) and a van which seats ten people (eight in the back and two up front). In high season carriages will be at the top of Harbour Hill at La Colinette to meet you as you arrive. There are two types of sightseeing trips 1 hour or 2 hour. 1 hour Tour goes from La Colinette up to the North of Sark and back down past La Seigneurie Gardens (with a stop at the gardens) past the Chapel on the West of Sark and then down to The Avenue and drops back at La Colinette. 2 hour Tour goes from La Colinette up to the North of Sark and back down past La Seigneurie Gardens (with a stop at the gardens) past the Chapel on the West of Sark down towards La Coupee (South) with a stop there and then back to The Avenue and drops back at La Colinette.